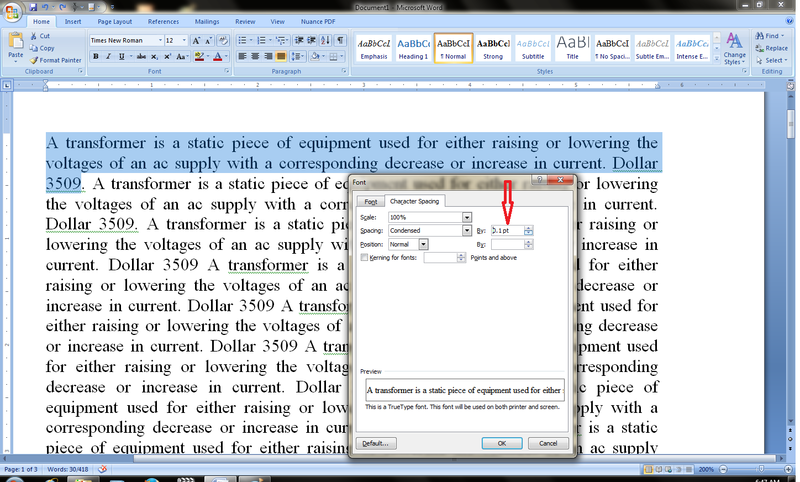 Preparing document or notes in Microsoft word is cool idea but sometime we need know about the options which available in word, so today’s topic is how to adjust text in limited space, this problem will occur when the sentence discontinue in next line, for example I am typing “communication skill” the “skill” gone in next line but I want to it come in same line, so how to do this without changing font size/style or without changing a page setup. So in this post I will show you to solve this problem. 2. Right click and click on “font”> “Character space” > click the “By” infront of “Spacing” and click down for condensed text. 4. If your text not adjust in 3 pt than select the more text and try. 5. You can use shortcut keys for this, select the text and press “Ctlr+D” leave the Ctrl and press “Alt+R,B” and than press “down arrow” key for adjust points. (Ooh don’t thing it’s too hard its so easy watch below video). This shortcut will work all the Microsoft word 2003, 2007, 2010 and 2013.